Take your Upward Sports Online! Go online with HTGSports, and make your Upward Program Simpler, Faster and Accelerate Registrations! Tired of spending hours manually typing registrations? HTGSports makes Upward league registration and management simple. Set maximum registrations per age group, grade, etc. You can generate an export of your registrations that can then be imported into ULM. Exported data includes all data needed for ULM including payment status. Use our evaluation forms to print out evaluation forms populated with data captured during registration. 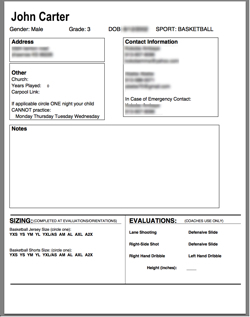 The form includes contact, sizing, and evaluation sections. Forms are available for soccer, flag football, cheerleading, and basketball. To get started with a no-risk evaluation call us today at 913.538.1001 or use our contact form located here.